Leonard Sumner is an Anishinaabe singer/songwriter from Little Saskatchewan, Manitoba. This year, he’s performing at Folk Fest! He has produced an album titled “Rez Poetry” and is well known for his lyrics about Aboriginal political issues and history. GOOTB: At what age did you begin singing and/or songwriting? LS: I began singing during my teenage years, but didn’t really write until my 20s. I did a lot of hip hop from age 14 to 20 as well. GOOTB: What encouraged you to become a professional singer/songwriter? LS: I went to a program called AMP Camp (Aboriginal Music Performers Camp) run by Manitoba Music when I was 25. LS: I’m still motivated by the same factors as I was when I first started. I love music, I want to be a good singer/songwriter. 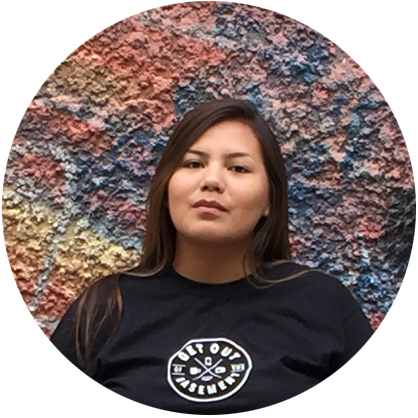 I want to educate people about Aboriginal issues through music across Canada, and to show people in my community that it’s possible to reach your dreams. GOOTB: Before being asked to perform, did you ever attend the Folk Festival? LS: I’ve never been to Folk Fest in Winnipeg. I really wanted to attend for a band about 10 years ago. That band was Los Lobos. GOOTB: Is this your first year performing? LS: Yes. I didn’t think I would play, or be asked, for Folk Fest in Winnipeg. I actually played the Regina Folk Fest last year and because the line up was sorted alphabetical, I was lined up beside Los Lobos. So I got to be beside them on stage as well. GOOTB: What are you excited about seeing/doing at Folk Fest? LS: I hear the grounds are incredible, but I have no expectations. I’m just going with the flow. GOOTB: What do you think the difference between performing at a festival and a regular concert? LS: At a festival, it’s more of a relaxed vibe. People like to listen and just chill. It’s a busy schedule but it’s more easy going. When I performed for Aboriginal Day Live, it was a televised event. There was a strict schedule and I had to be ready at all times. I had to perform my best songs in 15 minutes. Overall, they are both good. GOOTB: Which band are you excited to listen to at Folk Fest? LS: I am excited to listen to Dawes. I’m pretty sure they’re from California, they have a couple good songs. Shakey Graves and Blind Boy Paxton also have good songs. GOOTB: Do you still get nervous before performances? LS: I get a little anxious. The anticipation builds up, so I know that I’m going. I’m nervous for Folk Fest but I know that if I make a mistake, I’m prepared for a back up. I love performing. GOOTB: How do you feel when you are on stage/in front of a crowd? LS: It’s a good feeling but there s some self consciousness. It feels good being able to express myself and my thoughts. You’re giving everyone a bit to remember and connecting to everyone’s energy. You are also very vulnerable and conveying a lot of emotion. It also empowers you. GOOTB: How did you feel after winning Best New Artist at the Aboriginal Peoples Choice Music Awards in 2014? LS: I felt incredible. It was definitely one of the highest moments in my life and it felt really good. After, I was one of the headliners at the Pyramid and the show sold out. When I was singing, there was a point where they were singing back to me. I felt like Axl Rose from Guns N’ Roses, I felt like a rock star. GOOTB: Do you have any advice for aspiring singers or songwriters? LS: Stay true to yourself, practice hard, and write music you would want to listen to.